Adm. Scott Swift is the most senior U.S. Navy official to step down after the USS John S. McCain collision back in August. 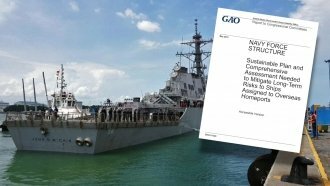 The U.S. Navy will make another leadership change after a series of deadly incidents involving its ships in the Pacific this year. On Monday, Adm. Scott Swift said he plans to retire as commander of the U.S. Pacific Fleet after he was passed over for higher command. As commander of the "world's largest fleet command," Swift oversees 200 ships and submarines, about 1,200 aircraft and more than 130,000 sailors and civilians. Swift is the most senior Navy official to step down after the USS John S. McCain collided with an oil and chemical tanker east of Singapore in August. Ten sailors on board the McCain died. Seven other sailors died in June when the USS Fitzgerald crashed into a merchant ship. Both of those ships are part of the Navy's 7th Fleet, which reports directly to Swift's Pacific Fleet. Swift relieved Vice Adm. Joseph Aucoin as the 7th Fleet's commander days after the McCain incident. Then earlier in September, two more leaders operating within the 7th Fleet were dismissed: Rear Adm. Charles Williams, commander of Task Force 70, and Capt. Jeffrey Bennett, commander of Destroyer Squadron 15. Williams oversaw the fleet's aircraft carriers, cruisers, frigates and destroyers; Bennett was in charge of the Navy's largest forward-deployed destroyer squadron. Swift didn't mention a retirement date, and the Senate will have to confirm his replacement.